Paintballing in Brighton with Delta Force: The Ultimate Experience! If you’re looking for the ultimate adventure paintballing in Brighton, then you need search no more! Delta Force Paintball in Brighton can offer paintball fans 4 exciting locations to visit closeby in West Sussex, Surrey and Kent. Our Sussex paintball centre is the most local to Brighton, positioned just one minute away from the M23 motorway. The centre is nestled in the beautiful Sussex countryside, providing a stunning backdrop to your game. 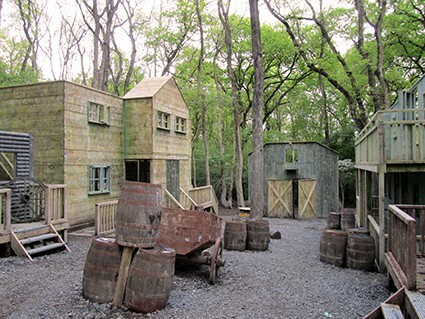 And with six exciting paintball game zones on offer such as Castle Wallenberg, Chemical Alley, Command Post and The Haunted Graveyard; there’s something everyone ages 10+ years will enjoy! We also have two further centres, both located in leafy Effingham in Surrey. 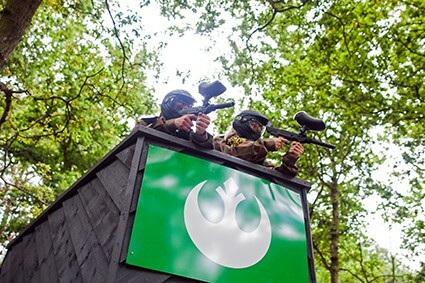 Our South West London and Surrey paintball centres are just metres apart in the gorgeous Surrey woodlands. Easily accessible from the M25, these two paintball centres are conveniently placed for those travelling from Brighton. The centres offer a huge variety of movie-set themed paintball game zones, including the new Space Warz game at the Surrey paintball centre! Additional games include London Town, A Bridge Too Far, Mad Murphy’s Jungle Attack, Command Post, Viet Cong Village and The Haunted Graveyard. Customers can also use smoke grenades, paint grenades and MK5 Thunderflash grenades during their game – these can be great for stunning the opposition or as a clever diversion tactic! 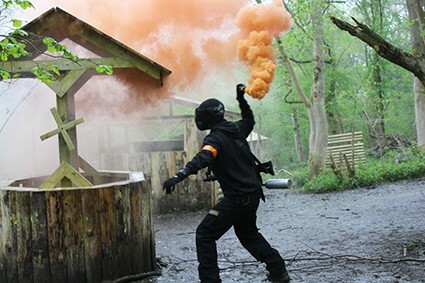 Another one of our venues local to Brighton is the Kent Paintball centre. Positioned just a few minutes from the Clacket Lane services at Junction 5 of the M25, it’s really convenient to get to. As one of the newest venues to join the Delta Force Paintball network, it’s been a popular choice with paintball fans looking to explore the newest game zones available! Featuring Hollywood style games like Wild West Saloon, which is set in a small village complete with themed shops such as a bank, bar and a goal, as well as lots of abandoned vehicles. Other game scenarios include London Underground; an adapted version of the London Bus game, featuring lots of abandoned double-decker buses and black taxi cabs! ).